YBLTV Erika Blackwell Review: Dok Solution LLC. : CR33 5 Port Smart Phone Charger with Bluetooth Speaker and Speaker Phone. YBLTV Erika Blackwell Review: Dok Solution LLC. : CR33 5 Port Smart Phone Charger with Bluetooth Speaker and Speaker Phone: in-use front of unit. YBLTV Erika Blackwell Review: Dok Solution LLC. : CR33 5 Port Smart Phone Charger with Bluetooth Speaker and Speaker Phone: in-use rear of unit. YBLTV Erika Blackwell Review: Dok Solution LLC. : CR33 5 Port Smart Phone Charger with Bluetooth Speaker and Speaker Phone: Front of Base Unit. YBLTV Erika Blackwell Review: Dok Solution LLC. : CR33 5 Port Smart Phone Charger with Bluetooth Speaker and Speaker Phone: Rear of Base Unit. YBLTV Erika Blackwell Review: Dok Solution LLC. : CR33 5 Port Smart Phone Charger with Bluetooth Speaker and Speaker Phone: Assorted Cords. YBLTV Erika Blackwell Review: Dok Solution LLC. : CR33 5 Port Smart Phone Charger with Bluetooth Speaker and Speaker Phone: Close-Up of power button. YBLTV Erika Blackwell Review: Dok Solution LLC. : CR33 5 Port Smart Phone Charger with Bluetooth Speaker and Speaker Phone: User Guide. YBLTV Erika Blackwell Review: Dok Solution LLC. : CR33 5 Port Smart Phone Charger with Bluetooth Speaker and Speaker Phone: Gift Box. Easy-Doks Dok CR33's sleek and compact design brings much needed charge and organization! Perfect number of sockets for the average-digital-daily user! Bluetooth connectivity simple to pair! I was very excited to receive and review Easy-Doks Dok CR33: 5 Port Smart Phone Charger with Bluetooth Speaker and Speaker Phone. 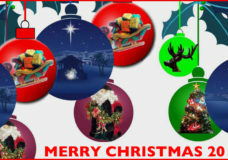 What a terrific gift – anytime of the year! Who doesn’t have at least 3 or 4 devices today? A smartphone, your iPod, a tablet… We all need to charge them — every day depending on our usage. And if you’re like me, I like to be organized. I don’t like clutter. I can’t stand cords. The CR33 is the perfect multi-charger docking station. Its three cradles hold my smartphone, iPod and tablet. If you have a flat-bottom phone like mine, the Samsung Galaxy S6 Edge – you can slide a small, plastic insert into one of the cradles; for round-bottom phones, such as a Blackberry – the insert isn’t needed. Without an insert, your phone or other device might not fit snugly into the cradle, so these inserts are a really nice feature. My tablet or MID is docked with the included detachable device cradle that when pushes down locks easily into place. I choose to place my tablet vertically but it can also be set horizontally in the station. So with these three devices resting in the CR33 base unit, I then plug in their corresponding USB phone or device charging cables that Dok Solutions has so wonderfully supplied in my gift box! This is an awesome plus — how many times have you had one of your device cords fry like mine from overheating or too much use!? Dok Solutions gives you 6 assorted cables that you then plug into your devices which then plug into their USB sockets on rear of the CR33 base unit for charging. The length of the cords isn’t very long – they don’t have to be! Even if you use your own charging cord that came with your smartphone — chances are it’s a longer cord. No worries! You can easily wrap your USB cords around the unit’s tidy cable organizer – how sweet is that! There are three, 5V 1A USB sockets. And there are two, USB charging ports nicely marked in red that are specifically used for charging 5V 2.1A smart devices. The CR33 recognizes all smart devices (phones and tablets) of 5V from 0 – 2.1A. Surge protection is built-in! The sweet spot for me with the CR33 is its Smart Current Detection (SCD) which ensures device protection by adjusting the current / voltage required for each device. Your devices will stop charging and never overcharge when your device is fully charged. 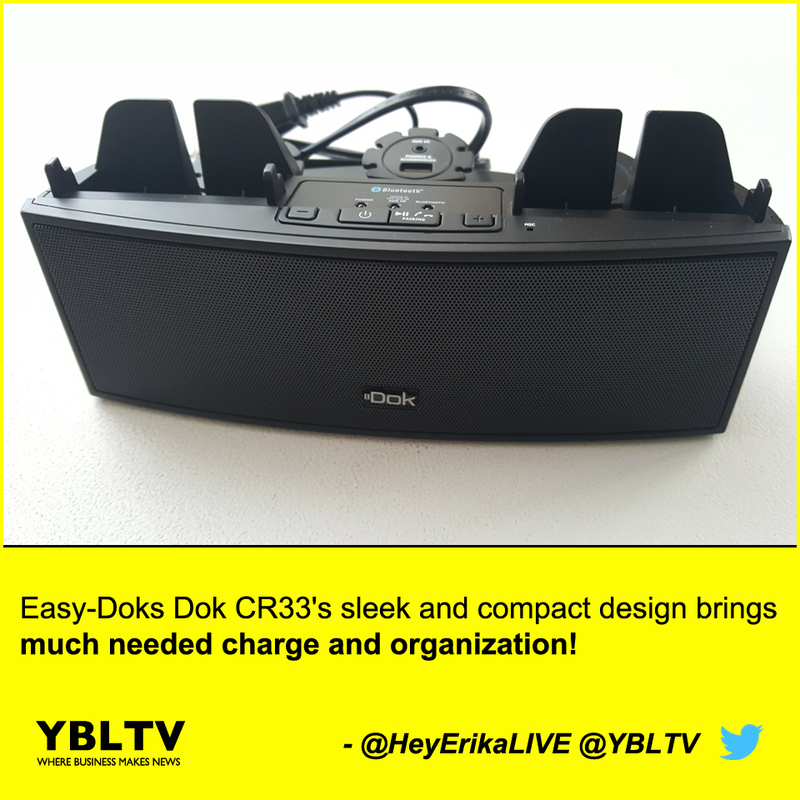 “Easy-Doks Dok CR33’s sleek and compact design brings much needed charge and organization!” – Erika Blackwell, YBLTV Multimedia Producer & Anchor. Now let’s talk about the CR33’s bluetooth connectivity! Start by powering up the CR33 unit by pushing down the power button. The Bluetooth indicator light will flash. Pairing your smart device using Bluetooth to the CR33 is a snap. If paired successfully, you’ll see the Bluetooth indicator light constant on the CR33. If not paired, the Bluetooth indicator light will continue to flash. Once paired, go ahead and play audio via Bluetooth. Simply press the play button to play or pause audio files from your smart device. Search for your favorite song and hit play! Sit back, relax and listen to your tunes through the CR33’s speaker. If you’re listening to music from your smartphone and you happen to also receive a phone call – no problem – your music will automatically pause and then resume when you finish your call by pressing down the play button. Push the volume up and down buttons as required during your phone call. Don’t you just love this wireless bluetooth speaker system? You can display, listen and view one device while charging others. Now let’s turn some attention to the audio input/line input (AUX-in) jack cable which is also included in the box. Simply plug one end of a standard AUX-in cord into the AUX-out / headphone jack of your device and the other end into the CR33’s AUX-in jack located in the rear of the unit. Don’t forget to press the play button to turn the unit on; power up your smart device and let your tunes rock! Just be sure to note that when the AUX-in speaker cable is plugged into the CR33 unit, the Bluetooth feature will not work. What should also be noted is that even in the OFF mode, as long as an active power is connected to the CR33 unit, your smart device can still be charged. Dok Solutions has placed a nice little order form at the back of their User Guide that allows the user to write-in their contact and credit card info for ordering USB charging cords for pre-Smartphone generations, such as Mini or Micro USBs. This may not be a big deal for some of you– but I still appreciate and sometimes often prefer the old-school way of placing an order! -Being connected 24/7 can be a burn-out, no? –Tear out the form, pop it in the mail and include $3.00 for shipping and handling along with your check or money order payable to Dok Solution, LLC. Be sure to fully read the Important Safety Instructions in the CR33’s User Guide. You’ll want to steer away from using your CR33 anywhere near water and moisture. Also, keep it away from any heat source such as a radiator, stove, amplifier or other device that produces heat. And as always, don’t overload wall outlets or extension cords! Organize/Charge any 5 portable smart devices including all phones, digital media and tablets all at the same time, in one location. Bluetooth/Wireless Bluetooth Speaker System with phone answering capability while charging & playing music through bluetooth wirelessly. I am very happy with the Easy-Doks Dok R33 from Dok Solution LLC. I can’t tell you how many times I can’t remember (yes!) where I charge my devices — which wall… which outlet… etc. The CR33 is a central docking station for all my devices. With its SCD technology, I don’t think I’ll be running out to buy and replace my fried, over-used charging cords anytime soon. Perhaps a future design suggestion might be a drawer and/or a second shelf for the CR33 base unit. By adding a small drawer or shelf– cords, other batteries or your TV remote could easily be stored in the CR33 — all in one great, central place. However, the company’s other solutions certainly provide additional buying options – so be sure to check them out! The CR33 helps keep me organized – and I need any extra organization in my ever-so-crazy busy life! So, thank you Dok Solutions for the CR33’s compact, sleek design that organizes me and keeps me connected with friends and family at the same time! The CR33 is very affordable at a price of $79.99. Disclosure of Material Connection: YBLTV Multimedia Producer / Anchor, Erika Blackwell received the CR33 5 Port Smart Phone Charger with Bluetooth Speaker and Speaker Phone for free from Dok Solution, LLC. in consideration for a Product Review. 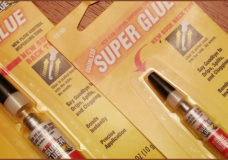 Super Glue Review: Fix it. Mend it. Join it. Bond it.